Ocean Club Jupiter is a gated beachfront community at 2000 S. A1A. It is one of Jupiter's newer condos built in the mid 90's. The 6 story building has 48 condos consisting of 2 and 3 bedroom condos overlooking their pool area as well as the ocean. The building is unique as the rooms have many corners and it is not your typical rectangular condo. Ocean Club has 9 ' ceilings and 12' ceilings in the penthouse units with 9 ft glass sliders. Underground parking for 1 car for all units and some units have additional parking. Condos range from about 1,300 to 2,000 sq. ft. They have a large pool area and clubhouse on the pool level. 3 month minimum lease and 35lb pet limit make these one of the Jupiter pet friendly condos on the beach. Take a look at Abacoa Jupiter properties for more pet friendly places. Personal interview required to move in. Ocean Club in Jupiter is a must see building. 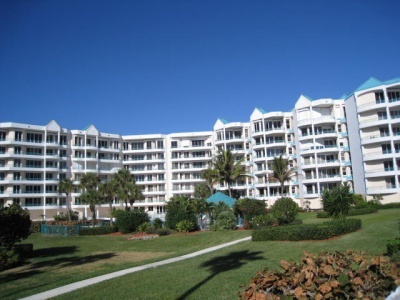 Many units have gorgeous views looking down the beach to the Juno Pier. Browse listings for available Ocean Club condos, and Read more about Jupiter beach condos in Ocean Club. The 01 stack are the 3 bedroom direct oceanfront stack closest to the beach. The condo has exterior walkways to enter your unit. They have a fitness center, club room and extra large storage cages all on the main floor. The lobby and clubrooms were just remodeled in 2013 as well as some updates to the pool area. Ocean Club also has a 6 - 3 story townhouse with elevators with direct ocean views from your living area and master bedroom. They sit directly on the beach road and they feature 3 car garages underneath. The townhomes have guest bedroom on first floor and a second floor living area with a third floor master. They are very unique. Look at Ocean Club when looking for Jupiter oceanfront condos. Located halfway between Jupiter Riverwalk and Juno Beach there is plenty of action in either direction. Across from the townhomes you have the beach crossover which brings you down to a peaceful quiet beach. Take a walk on the beach to Juno Pier for some exercise and you will pass Kite Beach known for all the kiteboarders who flock to the beach when the winds are up. Past Sea Colony you will find the crowds at the beach tend to increase as there is much more public access down this way including a few County Parks and additional parking areas. Either way you can enjoy a walk with a crowd of people or you can wander North where it will be less crowded. You will enjoy living at the beach here in Jupiter Florida. Search for more area properties on our other websites below. You will find Boca Raton homes for sale as well as Hutchinson Island condos that offer more affordable living than Jupiter. If a Ocean Club Condo listing has caught your eye or you want more information about Jupiter, FL real estate, please don't hesitate to call 1-561-744-7025, or email via our handy contact form with any questions or to arrange a showing.